Coleus plants or painted nettle has the botanical name Coleus blumei. They are native to South East Asia and are available in wide range of leaf shapes, sizes and colours including lime greens to the brightest pinks. They are an annual or tender perennials grown for their stunningly bright coloured variegated foliage. They grow well in shady areas or indoors. 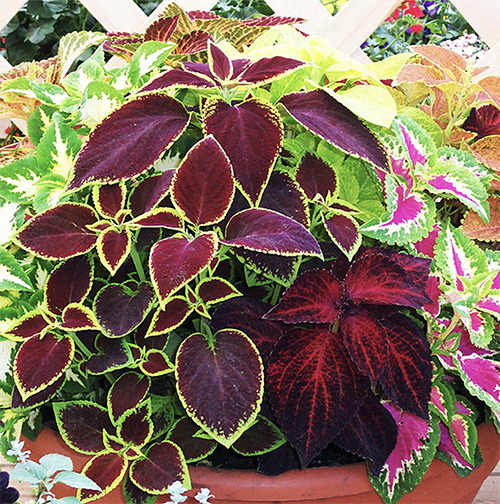 Coleus plants can add instant colour to your garden. These are easy to grow and propagate. The foliage remains colourful all through the summer and the flowers are insignificant. Coleus varieties grow so well that they will grow indoors, outdoors in partly shady areas and even in a glass of water where they will develop roots left in water for a short length of time. Transplant to a pot when a significant amount of roots have formed. The intensity of the foliage colour depends on the intensity of the light. Most plants produce their best colours when placed in light shade. To grow their best they need moist and well drained soil with a neutral to slightly alkaline pH. When planting in a garden bed, place them at least 12 inches apart. For good growth coleus grown indoors, need several hours of sunlight and a minimum temperature of 50o F. Pinching the stem tips when the plant reaches a length of 3-4 inches helps to reduce the height of the plant. Therefore this will give a bushy appearance to the plant by encouraging the growth of side branches. Though the shrub does not require heavy feeding, it is better to use half strength liquid fertiliser during the growth season, in summer and spring. Watering is required throughout the lifecycle. Water well during planting time and mulch the plants during summer to retain soil moisture. The Coleus plants can be easily propagated at home from seeds or from stem cuttings. There are many seed stores on Ebay and seed companies online that you can buy a seed packet that contains many combinations of vibrant coleus colours. Once you have bought some seeds you can sow the seeds in the soil indoors at least 8-10 weeks before the last spring frost. Seeds are small and should be sown in sterile potting soil, which is moistened. Cover the seeds with a layer of fine soil and keep the seeds covered using a plastic sheet. Keep the pot in a warm bright place till it gets sprouted. The new seedlings should start to sprout in two weeks. For stem cuttings a cutting of 3-4 inch for planting is needed, this will require a soft tip cutting. Rooting can be done either by planting the cutting in soil or soaking the cutting in a glass of water. Rooting hormone powder is not needed. Coleus is a tender perennial and the plant will show stunted growth when exposed to cold weather. Frost makes the plant to turn mushy. Coleus can live for several years in frost free zones. During winter, in frost areas it is necessary to plant them in container and move them indoors. Coleus is a tropical plant and the plant dies off when the temperature falls below 50 degree F. They must be near bright windows when kept indoors. Flowers are produced in summer and pinch off the flowers to increase the life cycle of the plant. Once the plant produces seed, the life cycle is completed and the plant usually dies. The older plants can be renewed by using propagation by stem cuttings. These plants are very durable and the plant grows back even if you cut the plant to the soil level. Spider mites, aphids, White flies and mealy bugs are the common pests of coleus. Slugs and snails also attack these ornamental plants.